Alexander Sergeyevich Pushkin (June 6, 1799 - February 10, 1837) was a Russian poet, playwright and novelist who is considered now the founder of modern Russian literature. He was born in a wealthy aristocratic family in Moscow and received the best possible education. 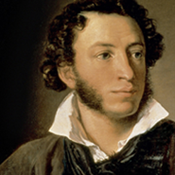 Pushkin's first poem was published when he was only 15 years old, so by the time he finished school as part of the first graduating class of the prestigious Imperial Lyceum in Tsarskoye Selo near Saint Petersburg, his talent was already widely recognized within the Russian literary scene (Wikipedia). In 1820, he published his first long poem, Ruslan and Lyudmila, which is one of his best known poems even now. As the years went by, Pushkin's ambitions grew as he made it his purpose to influence Russian history and the future of the Russian empire. He shared liberal political views, supported social reforms in the country and became a spokesman for literary radicals, which resulted in him being exiled from the capital. He traveled through the remote parts of Russia, including Caucasus, Crimea, Kamenka and Chisinau where he joined the Freemason movement. This cycle of him returning to Moscow, clashing with the government and being exiled repeated over and over again. His life full of travelling gave him a lot of inspiration and food for thought. His love poems are well known and cherished by many people all over the world even now. Many of them were later turned into songs. Being in exile in his mother's rural estate Mikhailovskoye, he also wrote one of his most famous dramas called "Boris Godunov." He couldn't gain permission to publish it until five years later. If you haven't read it or seen it in theatre, we strongly recommend it. Besides speaking about one of the toughest moments in the Russian history, the drama is also extremely emotional. Russian children love Pushkin's fairy tales: Tale Of Tsar Saltan And Three Sisters, Tale of The Golden Fish and many others. They are written in a simple language and in the poetic form, so many children know them by heart. However, Pushkin's life was far from being simple. As a result of his conflict with the government, Pushkin's financial debt grew. Moreover, in 1837, he heard the rumors that his wife had an affair. Pushkin challenged her alleged lover, Georges d'Anthès, to a duel which left both men injured, Pushkin mortally. He died two days later. The government feared a political demonstration at his funeral, so the ceremony was moved to a smaller location and was made open only to close relatives and friends. Though his life was short, Pushkin's legacy includes works of nearly every literary genre of his day, including lyric poetry, narrative poetry, the novel, the short story, the drama, the critical essay, and even the personal letter. Many of his works became foundational texts in their genres. He broke down the barrier between the colloquial speech and the elevated poetic pieces of the past. Thus, he is considered a father of the modern Russian language. Russians still use Pushkin's language today. He created an encyclopedia of the Russian life. Pushkin's most important work, though it is not very well known abroad, is undoubtedly "Eugene Onegin." He wrote it over the course of his life in 1823 - 1831. A prominent mid-19th-century literary critic called it an "encyclopedia of Russian life," because the novel developed and changed together with the changes in the society in those very dynamic times. Though the poetic novel it only about a hundred pages long, it took Vladimir Nabokov two full volumes and over seven hundred pages to fully render its meaning into English. He developed the main themes for the writers that came after him. He was the first to write about ordinary life of simple people, about the confrontation between an exceptional character and society, about the choice we sometimes have to make between the duty and personal happiness, and about going against the flow. Those ideas later remained a focus of attention for other great Russian authors like Dostoyevsky, Tolstoy, Chekhov and Bunin.